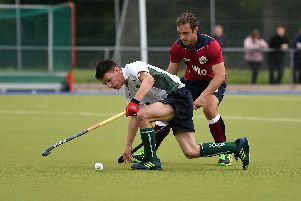 A fantastic show from City of Portsmouth men’s firsts saw them beat second-placed Hamble 4-0 to extend their advantage at the top of Hampshire League division one. The match started with the intensity and aggression that was expected in this fixture between the top two sides. City created a few early chances but were unable to capitalise until a Pete Hayward short corner strike was deflected high into the net by Luke Parsons. Hamble attempted to assert their own pressure but were punished with a flurry of cards. City went 2-0 up as they entered the break following a Chris Palmer tap in at the far post. The second half began much like the first with Hamble pushing hard chasing the deficit. City keeper Chris Ball was called into action only a few times and was untroubled by the Hamble forwards. Then City found themselves defending a short corner and successfully won the ball. An incredibly well-worked move saw a rapid counter attack and Stu Avery was on the end of a Rob Hunt cross to deflect past the keeper. Pete Hayward also scored to complete the impressive City of Portsmouth total with a well-struck short corner, low and hard into the corner of the goal. 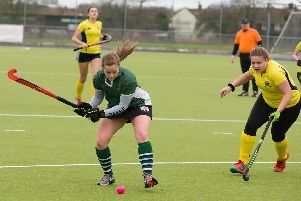 City of Portsmouth Ladies seconds earned a win against IBM in Hampshire League division five. With their usual good form they started well, netting from an early short corner. Michelle Hughes got the final touch on a Sarah Stewart strike. City maintained their defensive form and frustrated their opponents as they headed into the break with a narrow advantage. In the early exchanges of the second half IMB’s expereince showed as they beat City keeper Lucy Smith to level. City struggled to capitalise on a flurry of short corners but Jemma Gard ensured they got all three points by scoring just before the end of the game. Player of the match was awarded to Gard, with special mention to Danni Francis and Gemma English. City are seventh in the table with six wins.